It should be common practice for every cyclist to check the tires before any road trip, so even though it takes some effort to keep the tires properly inflated, doing this ensures your ride is safe and that tires last. So buying the best bike pump will absolutely guarantee you ride even more. A bike pump is one of the most indispensable and mandatory devices for both casual and serious cyclists alike. A bicycle tire pump is designed to serve a very simple purpose…to add air into the tires, ensuring these are inflated to the correct specification. To do so, you should have a bike pump for home use and another one to carry with you for emergencies or occasional use. Other things that every bicycle owner should have are tire gauges and tire repair kits. A tire gauge is helpful so that the rider can keep track of pressure. That will warn him as to when it might be necessary to pump some extra air. A repair kit is perfect for those unforeseen instances when one might have to fix a flat. For example, if the rider is one who participates in races, he will want to purchase a device that get the tires pumped quickly. That person might be temporarily knocked out of the race because of low tire pressure. A fast acting pump can get him back into the action so he can still ride to win. An individual who frequents the roads will want to buy a bicycle pump that weighs very little and does not restrict his cycling. The individual will want to pick a small pump as well as he will have to mount it somewhere on the bicycle. The smallest pump that can coincide with the pressure of his tires will be sufficient. If the individual is mostly going to stay near the home, he may want to select a good, sturdy floor pump. Floor pumps can also be used for other tasks around the home. Mountain bikers will have to consider two variables before choosing a bicycle pump. For one, the pump will need to be durable enough to withstand damage from stray rocks, tree branches, and other things on a trail. Secondly, the pump should have a design that does not hinder the person from traveling with the bike across a body of water such as a stream. Before starting the process of selecting a bike pump, the individual must have a firm grasp on what kind of riding he will be doing. It will make a huge difference. Several types of bicycle pumps are available to suit a bicycler’s needs. A floor bike pump is one of the more powerful types of pumps. They are mostly found in garages and bicycle shops. These devices can handle high-pressure tasks are successful at completing jobs that other pumps cannot handle. Floor pumps are very affordable and modestly priced. They come in a wide range of materials such as plastic, aluminum, and other metals. Floor pumps are best for people who do most of their cycle close to the home. They also make excellent repair shop pumps. Floor pumps can inflate tires much faster than hand pumps. A hand bike pump is very lightweight and inexpensive. 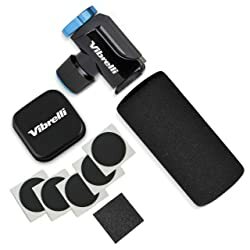 It is a great device for someone who is on a budget or is looking to conserve space and not weigh down the bike or himself. They are also excellent for young children and teenagers. Operation of this type of bike pump is very simple. The user simply sticks the needle into the tire valve and continuously pumps with his hand until the tire has been inflated to the desired pressure. The average inexpensive hand bicycle pumps can inflate a tire up to 120 PSI. However, these require much more work and pumping than the floor models. Mini bike pumps are a small version of the hand pumps. These are extremely inexpensive and can be mounted onto a bike without causing any interruption to the frame. Mini pumps are very efficient space saving devices. They are compact, easy to use and very affordable. They are super easy to carry and will help you continue you ride again faster. It requires a bit more time and effort to inflate a tire with a mini pump, but are a great emergency solution. A mini pump is a quick fix, but not a long-term solution. Foot bike pumps are not necessarily designed for bicycles. They are designed mostly for cars, but they do work well with mountain bikes, because these bikr models have large low-pressure tires. An individual who rides a mountain bike would want to consider this type of bike pump. Foot pumps are designed to be pumped with the foot. Most of them come equipped with a tire gauge so that the user can see how much air is he pumping into the tires. CO2 inflators are amazing because they can inflate the tire in a fraction of the time, compared to the other different types of bike pumps available on the market. Racers and mountain bikers use CO2 pumps mostly because of the quick inflation time and considering the weight factor. Some CO2 bike inflators can be discarded after one use. This saves time for the individual in a race who wants to just pump and go. The negative side to the CO2 inflator is the expense. They are more expensive than the other pump types because they are made with CO2. Most electric bike pumps are multipurpose devices designed to inflate many things, such as mattresses, car tires, inflatable pools, toys and of course, bike tires. Usually they have a gauge, so that the user knows how much pressure should he use. Some models feature a function where the user can set the desired pressure and the pump will stop automatically when that pressure is reached. In most cases electric pumps inflate the tires faster then other types of pumps due to the power they utilize. These electric air pumps normally come in 12V-120V power and are relatively inexpensive despite their advanced features. These are most suitable for someone who likes to save time, but they are not very small devices. Therefore this type of pump is typically used at home and it can be quite difficult to take with you on your ride. So, choosing the best bicycle pump depends on your bike model, your purpose of cycling and not least on your preferences. If budget plays an important role when buying a bike pump, you should go for a mini pump. If quality is the most important aspect, then you should perform a great deal of research before buying the best pump for your needs. The ideal situation would be to have one pump at home (a floor bike pump or an electric pump) and one pump to carry with you on your trips (a mini pump or a CO2 inflator). This way you should be able to pump up your tires no matter where you are.